Two main issues stand out in the forthcoming elections – the emergence of three to four new parties likely to win seats in the parliament, and the ambiguous role of President Milos Zeman. The party expected to win the highest number of mandates is the Czech Social Democratic Party (CSSD) – to the detriment of Necas’ right wing Civic Democrats (ODS), a party ravaged by scandals of clientelism and alleged connections to the so-called “godfathers” (i.e. networks of powerful businessmen and lobbyists who have had great leverage over public procurements in the country). For this reason the Civic Democrats – one of the strongest and most established parties in post-revolution Czech Republic – is expected to receive only 8 to 10 % of the vote. Nevertheless, CSSD is facing internal problems as it is increasingly split between two factions – one that supports Milos Zeman (who was formerly chairman of the party) and one that wishes to keep its distance from the president. Why does the president play such an important role in the legislative elections? In theory, the Czech Republic is a parliamentary system. 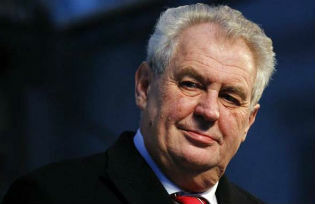 But this does not seem to suit the vision of Milos Zeman, who got elected by promising to be a more active president – and judging by the outcome of the popular vote, a majority of the Czech supported this proposal. Some analysts now argue that the Czech Republic is slowly shifting towards a semi-presidential system, as Milos Zeman is wielding unprecedented power – or rather influence – at least when compared to that of the two former post-revolution presidents, Havel and Klaus. Despite his campaign promise that he would be an impartial and above-the-melee president (a claim shared by both his predecessors), Zeman is subtly seeking ways to influence the final outcome of the elections. Zeman uses every chance to discredit the former right-wing government, and his picture appears on billboards of the SPOZ party with the quote “I will give my vote to SPOZ. Will you?” (the party denied that “I” refers to Zeman, but the connection is obvious). He also managed to weaken the Social Democrats by supporting the “pro-Zeman faction” within the party, because a weakened CSSD will theoretically mean more votes for SPOZ. Two weeks before the elections, it appears that the new parliament will either be controlled by a coalition that is loyal to Zeman or dysfunctional because lacking an organized opposition. Either scenario fits perfectly into Zeman’s conception of presidency – the parliament will be either too weak to confront him or it will be controlled by his supporters, leaving him room to widen and expand his presidential powers. It is clear that this future political constellation could informally turn the Czech political system from a parliamentary to a semi-presidential one – at least for the duration of Zeman’s presidency. Jan Hornát is a Ph.D. candidate at Charles University in Prague and a project assistant at the Forum 2000 Foundation.